"I write about the science they're selling you." A “sentinel” population in the vastness of the Indian Ocean has long attracted scientific interest because of how much dietary methylmercury its members consume. The thing is, though, that as much as scientists have looked, they have yet to find any problems related to this intake. In the latest study with this ‘sentinel population’, researchers again have found no link, this time between autistic behaviors and maternal mercury exposure during pregnancy. The population in question lives in the Republic of Seychelles, an island chain lying northeast of Madagascar. As islanders, the people of Seychelles consume a lot of fish–10 times more than the average U.S.-ian or European–and much of what they eat contains methylmercury, although at low levels. Still, those amounts are greater than much of the rest of the world eats, clocking in as high as 20 times what the average American might take in. This unusual situation of 87,000 people naturally consuming a diet that is relatively high in mercury attracted the attention of epidemiologists in the 1980s, when the Seychelles Child Development Study launched specifically to examine the developmental effects of this low-level dietary exposure. In the 30 years of the study, the investigators have yet to find any evidence of negative outcomes. The latest non-finding relates to autistic behaviors and their lack of an association with the dietary mercury. First author Edwin van Wijngaarden and colleagues, whose paper will appear in September in the journal Epidemiology (abstract here), evaluated 1,784 young people and their mothers, enrolled in the study from 1986 to 2001. Using maternal hair samples from the time the women gave birth, the researchers could get a ballpark idea of the overall body burden of methylmercury during the women’s pregnancies. Using two screening tools that parents and teachers completed, the team then evaluated the children in the group for autism-like behaviors. These screens are not diagnostic of autism but identify behaviors that are autism related. When the scores on these screening tools were considered along with maternal mercury values, no link emerged, with one exception; more on that below. These findings probably were not that surprising to the investigators given their fit with previous reports from the same population showing no link between methylmercury and other measures, including intelligence. "We did observe an inverse, beneficial association (of mercury) with the social awareness subscale. There is no reason to believe that low levels of exposure to methylmercury would improve scores on the total Social Responsiveness Scale or any of the other subscales. In previous studies of the main cohort, we have also observed beneficial associations of prenatal methylmercury exposure with developmental outcomes on several occasions (italics mine), which may be due to unmeasured confounding effects of beneficial nutrients found in ocean fish." Such are the quagmires into which correlations can lead us. As with all studies, this one comes with several caveats. Primarily because of the decades-long period of the study and variations in data collection over time, the researchers couldn’t adjust for all of the possible variables that might have skewed the analysis. One thing they note is that the study population comes from an area with almost 100% vaccination uptake and where vaccines contain thimerosal, so exposure to thimerosal–which contains a different form of mercury (which I explain here)–was considered to be consistent across the group. The mothers in this study had methylmercury levels about 10 times higher than those of the average US mother. 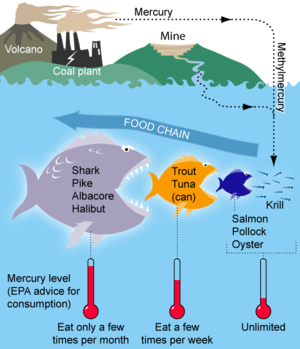 As the apparent benefit of methylmercury exposure indicates, what remains unclear is whether or not their concurrent consumption of fish along with the mercury contaminant somehow is protective against any negative developmental effects. These lingering questions leave open the biggest question of all for pregnant mothers, which is, ‘Is it safe to eat fish during pregnancy or not?’ As far as US residents go, the guidelines remain unchanged, and according to one expert, will not undergo a rewrite because of these findings. So for now, the official, almost decade-old recommendation remains the same: Limit fish consumption during pregnancy, particularly fish that tend to accumulate methylmercury. Mercury in fish. Consumption advice is for non-pregnant adults.